This past Monday Germany’s Focus magazine finally released official press information about a stash of 20th century art that was discovered back in 2011 under the headline “The Nazi Treasure” (Der Nazi-Schatz). German investigators and tax officials discovered a cache of 1,400 pieces of “degenerate art” when they visited the cluttered apartment of Cornelius Gurlitt in Munich. They found missing paintings, both known and previously unknown, by famous painters such as — it has Picasso, Renoir, Max Beckmann, Henri Matisse, Marc Chagall, Pablo Picasso, Auguste Renoir and Henri de Toulouse-Lautrec, and other works have never been seen before now! Gurlitt is the son of a WWII official who, obviously, was also an art collector during this time and probably had to hide his collection of so called “degenerate” art. So degenerate art, what is that you may be asking? Well first, a little known fact about Hitler is that he a failed art school in Vienna. He was told he was not very talented, and he was rejected by the arts academies. He held a grudge over the negative criticism, but he still considered himself an “arbitrator” of art. Later when he came into his power he organized the Degenerate Art Exhibition (Die Ausstellung “Entartete Kunst”) in an effort to control Germany’s media and art culture. Hitler commanded Nazi solders to confiscate modern art that, according to him, promoted anti-Nazi ideas. According to the art school flunky, art could be deemed degenerate if it “insulted” German feeling, or destroyed and confused natural form or simply revealed an absence of adequate manual and artistic skill. So basically any art that showed support for free thinking ideologies was labeled degenerate, and that definition includes nearly all modernist art. The exhibit was designed to promote the idea that modernism was a conspiracy by people who hated and conspired against German decency, also called Jewish-Bolshevist. (Although only six of the 112 artists included in the exhibition were in fact Jewish.) The second purpose of the Degenerate Art show was to identify which artists were considered verboten by the Nazi leadership. The exhibit consisted of 650 works of art by modernists like Marc Chagall, Georg Grosz, Wassily Kandinsky, Ernst Ludwig Kirchner, Paul Klee, Georg Kolbe,Wilhelm Lehmbruck, Franz Marc, Emil Nolde, Picasso and others; all of the art was stolen from German museums and galleries. 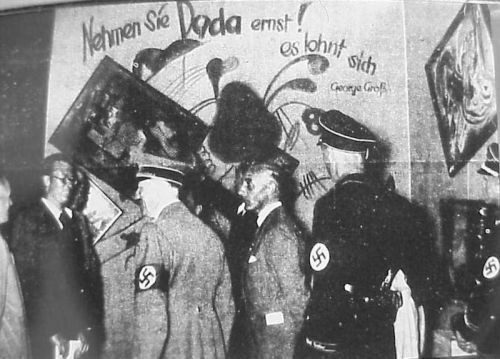 Hitler and the Nazi leadership pulled off of museum walls thousands of pieces of art that were considered “degenerate,” and exhibited them in Berlin. The show ran from July 19 to November 30, 1937 and was hosted in the Institute of Archeology in the Hofgarten. The day before the exhibition started, Hitler delivered a speech declaring “merciless war” on cultural disintegration, attacking “chatterboxes, dilettantes and art swindlers”. One million people attended the exhibition in its first six weeks which is an average of 20,000 people per day!— and the final estimate is that about 2,009,899 visitors attended the show. Oh and the exhibition was held simultaneously with the Große Deutsche Kunstausstellung (“Great German Art Exhibition”), which served as a counterpoint to the Degenerate show. Its purpose was to example “proper German sensibility” and displayed the classical and “racially pure” type of art advocated by the Nazi regime. That exhibition was hosted near Hofgarten, in the Haus der Deutschen Kunst and was described as mediocre by modern sources; it attracted only about half the numbers of the Degenerate Art show. Many works were displayed without frames and partially covered by derogatory slogans. No catalog was created for it, and it had to be reconstructed by modern scholars from secondary sources. But not all of the stolen art was put on display. Historians estimate that around 20% of great European art was stolen by Nazis during WWII, so there is a great deal of outstanding art to be found. The recently discovered Munich trove is part of the continent’s seven-decade rediscovery of an artistic heritage that is still recovering from the Nazis’ efforts to wipe it out. This collection of looted art has an estimated value of $1.35 billon. Stolen art is known to be out there in private hands, but this kind of cache of nearly 1,500 works is really just unprecedented. It’s a mind blowing huge collection and I would just LOVE to be one of the historians there to document it. I am sure that art historians will have their hands full recording it all and museums and dealers will be busy trying to figure out who owns which pieces— apparently there are some outstanding requests to locate some of the art found in this cache. But according to Anne-Marie O’Connor, a Jerusalem-based journalist interviewed for an NPR article, this discovery will probably affect the art market more than the art history, and drive up the price of paintings by these artists that are already privately owned.